Innovative Film City is one of the amusement parks in the Garden City. The film city is located on the outskirts of the city around 40 km on the way to Mysore. The film city has a total area of almost 58 acres and was opened in the year 2008. The place is divided into two parts. The first part includes the amusement park, museums, rides, etc. The second part has a studio and a film academy which is used to shoot movies, commercials, etc. By Air: The nearest airport is the Kempegowda International Airport in Bengaluru, which is approximately around 77 km away from here. By Train: The nearest major railway station is the Krantivira Sangolia Rayanna Station Or Bengaluru City Junction, which is approximately around 40 km from here. The station offers good connectivity to all major towns and cities across the state as well as around the country. By Road: One of the best ways to reach Innovative Film City is by road. The place is well-connected by roads and there are regular buses which operate from Bengaluru to the amusement park. From Bengaluru via Nayandanahalli, Kumbalgodu and Mysore Road, it would take you about an hour or two to reach the destination. The roads leading to Innovative Film City are well maintained as the highway connects you to various other major towns and cities across the state. The road takes you through some of the areas on the outskirts of Bengaluru city such as Jnana Bharathi, along with other major places such as Nayandanahalli, Kumbalgodu, etc. Innovative Film City is owned by the Innovative Group of Companies, which is led by Saravana Prasad who goes by the motto "Leadership is not about managing things but about developing people". The group's first venture was in the year 2000 by the start of Innovative Multiplex, which is the first multi-screen theatre in the state of Karnataka. Innovative film city is situated next to a natural lake and is spread across 50 acres of land which has a lush green cover. 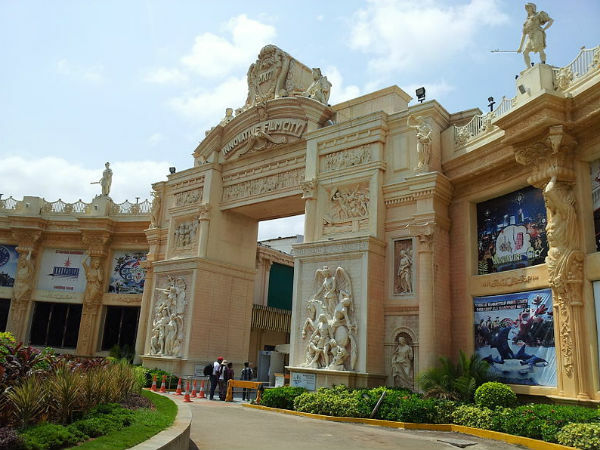 The film city has slowly grown from its inception to a level where it has been recognized by the Government of Karnataka as a tourist landmark in South India. One can experience many rides and spend an entire day by getting into every ride and attraction which is spread across its vast area. The Aqua Kingdom here has a beach-like appearance and it is one amongst the major draws here. The beach-like appearance is added by the wave pool. Water slides, children's play area and a dance floor make it a major draw here. The Dino Park is something which is very unqiue to be seen here. The park showcases some life size models of dinosuars with a 40 ft tall skeleton of T-rex and a 60 feet automated dinosuar, which sure would grab the attention of any person visiting the place. Haunted Mansion is another major draw. The very look of the exterior of the place would raise the curiosity level of any person who loves to watch horror movies as the structure reminds you of the sets of old Hindi horror movies. The film city is open from 10:00 am to 6:00 pm every day and the tickets are priced at INR 350 on all days.